A pecan tree is as American as apple pie. It is even the official Texas state tree. 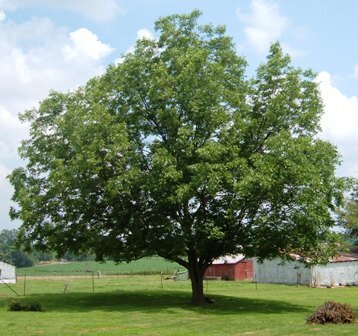 In fact, it is the only major nut tree to grow in North American naturally. They provided nuts to Native Americans for hundreds of years before the first Europeans landed on the continent. Later, the tree proved to be valuable to the American settlers both as a source of nuts and wood. 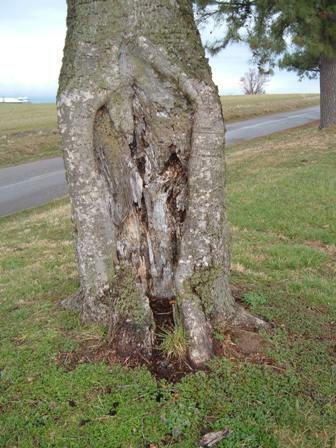 By the mid 1800's grafting was successfully used to make trees yield "improved" nuts. Late in the 1800's pecans became a commercial product for America, partly due to the use of grafting that provide producers a better crop of higher quality and more desirable nuts. As I mentioned on the homepage, our property is home to three pecan-producing trees. Two of them look to be of similar age. The other one appears to be pretty old and probably nearing the end of its life. It has lots of dead branches and some rotted spots. 1. Native to the Lower Mississippi Valley (Louisiana Gulf Coast up through Southern Illinois, west into eastern Texas and Oklahoma.) They like rivers and creek bottoms, and the Mississippi River and it's many tributaries provide just the right conditions. 7. 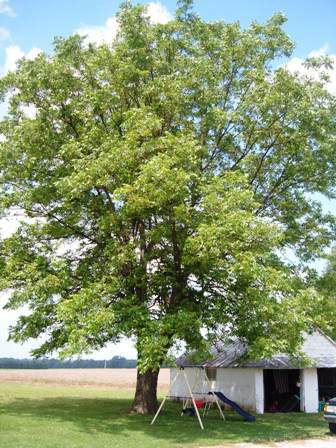 A pecan grove refers to a naturally occurring group of trees, while a pecan orchard indicates the trees were planted by men intentionally.